I feel compelled to share a piece of my personal story. I put everything else out there, why not this? 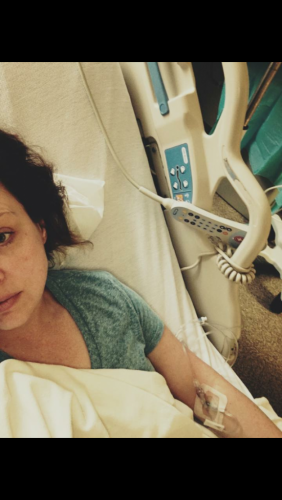 About six months after a very ugly divorce, I was diagnosed with Crohn’s Disease. It is an incurable autoimmune disorder that effects the digestive system. There are a myriad of symptoms and complications that go along with the disease. The intestines become chronically inflamed which can cause narrowing(strictures) or bowel obstructions. My body doesn’t absorb nutrients the way it should. I won’t get into all the pretty little details. Fistulas, bowel resections, colostomy and colon removal are all scenarios that may lurk in my future. It is all quite scary, especially since I am now a single mother of three. To treat my disease, I have to take pills priced at $1200.00 a month. I am also on infusions of an immunosuppressant drug every eight weeks to the tune of $10,000.00 each. This drug, which is made partially from mouse proteins, essentially shuts down my immune system so that my body might stop fighting itself. This opens me up for all kinds of infections and fun things. When you have one type of autoimmune issue, others tend to follow. This drug has already caused me to develop a hybrid type of psoriasis. So, these medicines that I had to fight my insurance company for, that are supposed to heal me, could also at the same time be harming me further in yet unseen ways. Each infusion brings relief and fear in the same needle. Since I have been on Remicade for the past ten months or so, my disease has somewhat gone into remission. The drug cocktail seems to be working presently, and my health has improved. The Affordable Care Act, or Obamacare as some like to call it, allows me to continue my treatment. I am clinging on to my insurance for dear life, as much as Blue Cross would love to pry it from my fingers. I am dependent on insurance to allow me these drugs that will give me quality of life, that will allow me to raise my children on my own. I am dependent on corrupt insurance to feed me corrupt pharmaceuticals. Lead by corrupt politicians that would love to take it all away from me and millions of others just like me. My fate now resides in the hands of the elderly. The median age of the members of congress is 60 years old. That’s at least twenty years my senior. More than half of all the senators up for reelection in 2018 are over the age of 65. On top of this, only about 19% of congress is comprised of women. I am represented by a bunch of old men. Do you think they have ANY of my best interests at heart? What is bad for me should not be good for you and vice versa. I don’t know what the solution is. What I do know is that I am scared. I am dependent on an unaffordable drug that may very well kill me in the long run and an insurance company that would rather I suffer than pay the claims I will definitely be racking up. Worst of all, I must rely on a bunch of faceless, self-aggrandizing, rich old men catering to themselves. The buffoon leading the parade distracts by condemning athletes for peacefully protesting against injustice. All while shrugging off white supremacy I should add. My reality doesn’t revolve around over paid sports figures. Our commander in chief is not much, but he is a master of misdirection. I want you to open your eyes to this. I do not want anyone to pity me, I want acknowledgement and to educate. I want to be heard and advocate for those of us that PREEXIST. My silence would be a luxury that I don’t need. These are just a few of the things that have been running through my mind lately. There are a lot of huge issues being swept under the circus tent. Please, you filthy rats, don’t take my mouse juice away.